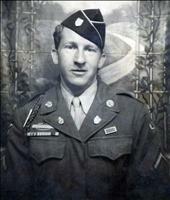 David Conrad Meyer died Nov. 15, 2007 at Panama Nursing Center in Panama City after several years of declining health. He was a lifelong resident of Apalachicola, where he was born Feb. 4, 1925, attended by the local nurse Ms. Nightingale. Later in life he would help row this same lady up the Apalachicola River to help tend her honeybees. At a young age he became head of the household, due to the early deaths of his father, Lawrence "Lonnie" Meyer, and his older brother, Fred Meyer, a World War II fighter pilot. As head of household he was not allowed to serve in combat, but answered the call of his country as an aviation machinist mate based out of Jacksonville, Vero Beach and Melbourne. He also volunteered to fly as spotter during stateside patrol flights. After the war, he worked with the late Roy Smith building the line of wooden "Witchcraft" boats and rebuilding Mercury Marine Outboards for racing. With marriage and a growing family, he started Meyer's Decorators and Upholstery in Apalachicola. Some of his work can still be seen in local houses from the 1960's. In the early 70's he became a bus driver for the Franklin County School Board, where he ultimately became director of transportation and maintenance for the county school system. He retired from the county at age 72 to the house he built for his family in 1953 in Apalachicola. A true renaissance man and a kind and gentle soul, he will be missed greatly by friends and family. Preceding in death were his parents, Ruby M. and Lonnie F. Meyer; brothers Lawrence F. and John B. Meyer; and sister Lena M. Gustavson. Survivors include his wife, Jeanette B. Meyer; brother Dr. Jackson A. McNeil; son David C. Meyer, Jr., and wife Michelle; two daughters, Constance J. McGinnis, and Donna G. Ingle, and husband Al; four grandchildren; Charles C. Ingle, John L. Ingle, Kendall M. Meyer and Jackson L. Meyer; sister-in-law; Maria Jane Vause; nieces Barbara Gustavson LaVecchia and Stacy Vause; and nephews; Robert L. Gustavson, Kelly Vause, and John McNeil. A simple graveside ceremony, officiated by Mikel Clark, was held Nov. 18 at Magnolia Cemetery. Funeral arrangements by Kelley Funeral Home.